When I learned that our visit to Europe would coincide with the largest collection of redheads on Earth, I knew I wanted to participate! We drove from Denmark to the Netherlands over the weekend — collecting our campervan along the way — to join with 6000 other auburn-haired beauties in the annual Redhead Days festival in Breda, the Netherlands. I only saw one other redhead with dreadlocks at the festival on Sunday. This image is not mine. I’ve lost the link to the photographer. Contact me if you find the original online so I can attribute it properly. The festival was very well organised by a modest corp of volunteers and was held in the centre of town, adjacent to Valkenberg Park. When I drove into the small city, I didn’t really know where the main events were being held, but it was easy to stalk the groups of redheads and find the main mob of gingers. Local businesses participated enthusiastically, opening at uncharacteristic hours to cater to the reported crowd of 40,000 visitors to the small city. Local beauty and hair salons offered free or discounted sessions to redheads, and a string of market pavilions offered merchandise that could tie in with the festival’s theme. The girls loved spending time in the arts pavilion which was well-maintained by volunteers who kept the craft materials in a tidy arrangement. They cut, pasted and glittered multiple collages for over an hour while I ogled the passers-by. It was strange to be surrounded by a sea of gingers. Men, women, children — all with slightly different shades of rose-gold — and in all shapes and sizes. 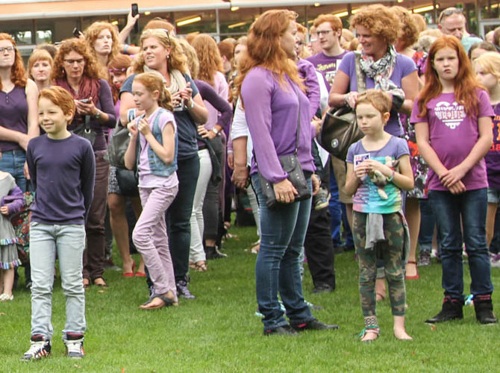 Most redheads wore purple shirts — this was requested by the festival organisers. Each year, the group photoshoot looks spectactular as the crowd sports the same colour! Photographers stood on a scissor-lift's platform to photograph the crowd of redheads. 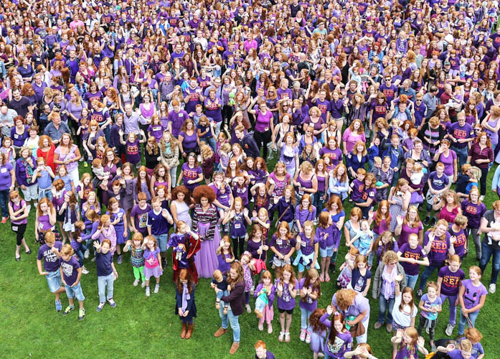 Over 1700 people participated in the group photoshoot, most of them wearing the designated colour of purple. Cropped image of Roodharigendag Breda – 2014 © Omroep Brabant, shared under Creative Commons license. Brioni happened to be wearing purple today and joined in with the group photo. 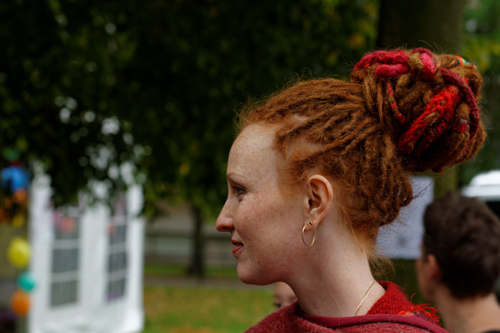 Cropped image of Redheadday2014-7 © Marc van der Molen, shared under Creative Commons license. After the main photoshoot on Sunday, we decided to skip the afternoon concert and drive on. Our detour to Breda was worth the experience of joining such a unique crowd, and I’m glad we made the effort. The RedHeadDays festival usually happens the first weekend in September. Organisers are already planning next year’s event, so if you’re in Europe, you may want to consider going.